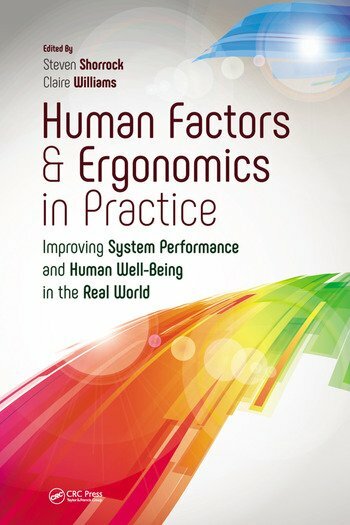 This edited book concerns the real practice of human factors and ergonomics (HF/E), conveying the perspectives and experiences of practitioners and other stakeholders in a variety of industrial sectors, organisational settings and working contexts. The book blends literature on the nature of practice with diverse and eclectic reflections from experience in a range of contexts, from healthcare to agriculture. It explores what helps and what hinders the achievement of the core goals of HF/E: improved system performance and human wellbeing. The book should be of interest to current HF/E practitioners, future HF/E practitioners, allied practitioners, HF/E advocates and ambassadors, researchers, policy makers and regulators, and clients of HF/E services and products. The purpose of the book is to to convey some of the perspectives and experiences of practitioners on the real practice of human factors and ergonomics in a variety of industrial sectors, organisational settings and working contexts. The book blends literature on the nature of practice with reflections from experience, and offers insights into the achievement (and non-achievement) of the core goals of HF/E: improved system performance and human wellbeing. Contextual and systemic: The book takes a holistic approach to HF/E, emphasising the context of real HF/E practice and the systemic nature of the discipline and profession. Diverse and eclectic: The book offers multiple perspectives from practitioners from different industries and settings and industry-focused researchers. The diversity of HF/E in practice means that the chapters have an eclectic feel; we avoided stipulating a certain style or format, or a need for extensive referencing, since this is not the reality of practice. But as a whole, the authors give complementary insights into HF/E in practice. Experiential and reflective: The book recounts real experiences and reflections of practitioners and other HF/E stakeholders via reflection and narrative, and this is prioritised over citation and referencing. Authors also consider some of the lessons learned and not learned by the profession, and some of the wider implications for the profession. Genuine: The authors are honest about HF/E-as-done, without assuming ideal conditions. The authors discuss some of the factors that influence practice and outcomes in ‘messy’ and constrained environments, including the compromises and trade-offs that are necessary in practice. Useful: The book aims to help improve professional practice, via practical wisdom from experienced practitioners (e.g., ‘advice I’d give myself if I were starting over’). clients of HF/E services and products to become more active and instrumental in the success of HF/E in practice. This edited book features chapters and commentary by many experienced HF/E practitioners situated in a diverse range of contexts, including consultancies, manufacturers, service providers, universities and other institutions. The chapters are diverse in content, approach, tone and style of writing, reflecting the individual authors, their roles and experiences, their working contexts and preferred approaches to writing. In this blog, you will find practitioner summaries for each chapter, and some reflections from early readers. You are invited to reflect on the general themes within each chapter via the comments. We hope you enjoy the book and this blog.